A North Carolina man is facing criminal charges for creating an amusing piece of public art from construction barrels. Joseph Carnevale, 21, was nabbed Wednesday after a Raleigh Police Department investigation determined that he was responsible for the work constructed May 31 on a roadway adjacent to North Carolina State University. Carnevale was charged with misdemeanor larceny for allegedly building his orange monster from materials pilfered from a construction site. 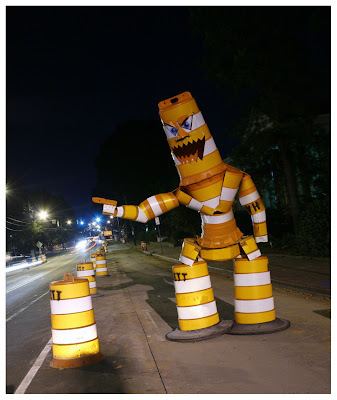 According to an arrest warrant, Carnevale "destroyed three road blocking barrels by cutting and screwing them together to form a statue." He's said to have caused $360 in damage and is scheduled for a July 21 court hearing.